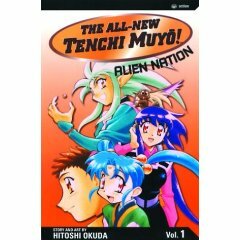 Tenchi is back and so are his otherworldly housemates. There's Ryoko, the love-smitten space pirate. Akeka and Sasami, royal princesses from planet Jurai. A carrot-topped super-genius named Washu. Mihoshi, the ditzy Galaxy Police officer and a bioorganic fuzzy spaceship named Ryo-oh-ki. Together, this zany bunch battle evildoers from outer space in-between bouts of bickering and flirting.